2018 commemorates the anniversary of the birth of Sheikh Zayed bin Sultan Al Nahyan, also widely known as “the wise man of the Arabs”. Born on May 6, 1918, he was the first Emir of Abu Dhabi, going on to become the founder and undisputed leader of the United Arab Emirates from the date of its creation on December 2, 1971. He died on November 2, 2004, aged over 80, having devoted thirty years of his life to structuring the United Arab Emirates. Sheikh Zayed made his country into a leading regional power, developing the country’s resources and generously redistributing oil wealth to its inhabitants. He transformed his nation, building hundreds of schools and hospitals, as the sands also gave way to the steel and glass of luxury hotels. 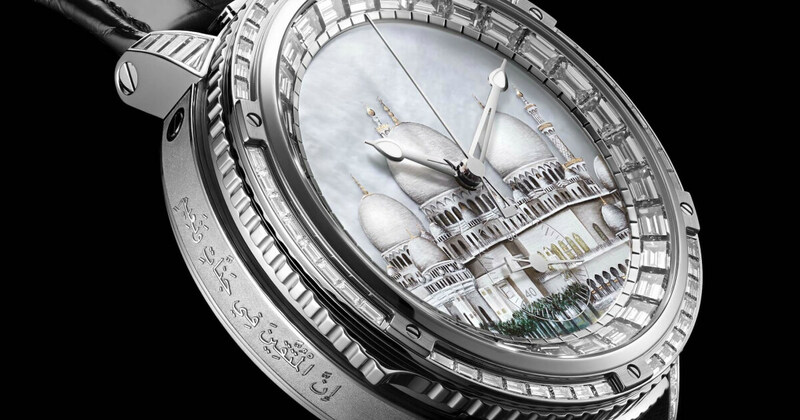 Louis Moinet is celebrating the Year of Zayed, with the creation of a unique masterpiece: the “Sheikh Zayed Grand Mosque” timepiece. Three years of work were required to manufacture this exceptional watch. Why did it take so long? First of all, because it involved seeking out a hundred-year-old movement, one that was first manufactured at the time of Sheikh Zayed’s birth. And so it is that the heart of this timepiece was designed a hundred years ago, in the Joux Valley, just a few kilometres from where Sheikh Zayed liked to spend his holidays, in Lausanne and the surrounding Canton of Vaud, in Switzerland. It is a rare piece, and includes complications. Its minute repeater chimes out in memory of the glorious times enjoyed in the United Arab Emirates under the Sheikh’s guidance, while the chronograph marks out the passage of time, calling to mind the Sheikh’s race to build his country as fast as was possible. This historic foundation was then revisited to produce to an accomplishment of great cultural importance, appropriately displayed in quite an extraordinary housing. The case is made from 18-carat gold, using a patented manufacturing process. To enrich the sound of the minute repeater and discreetly activate the chronograph, more than a hundred component have been crafted for this unique timepiece, most of them fully hand-finished. The dial is a work of art. 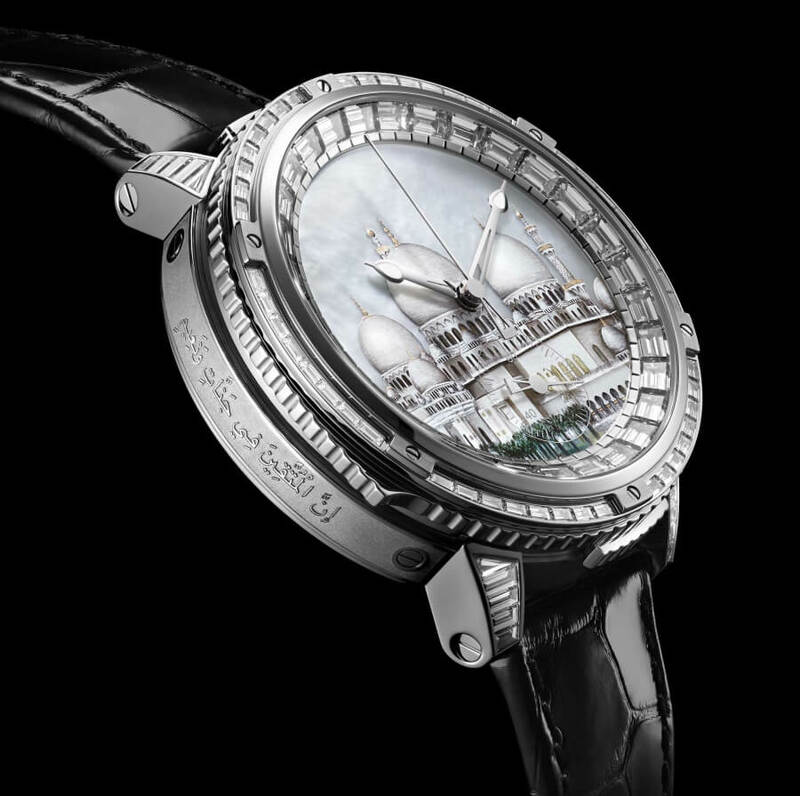 It represents the legendary Sheikh Zayed Grand Mosque, commissioned by the Sheikh himself. It is the largest Mosque in the United Arab Emirates, with a capacity of 40,000 in with a space of 22,000 square metres, and is the largest man-made marble structure ever to have been built. Every aspect of its dazzling beauty, from the largest to the smallest, has been distilled onto a mother-of-pearl dial, hand-painted by a miniature artist. A special and possibly unique technique has been used to add a slight relief effect to this micro-painting. 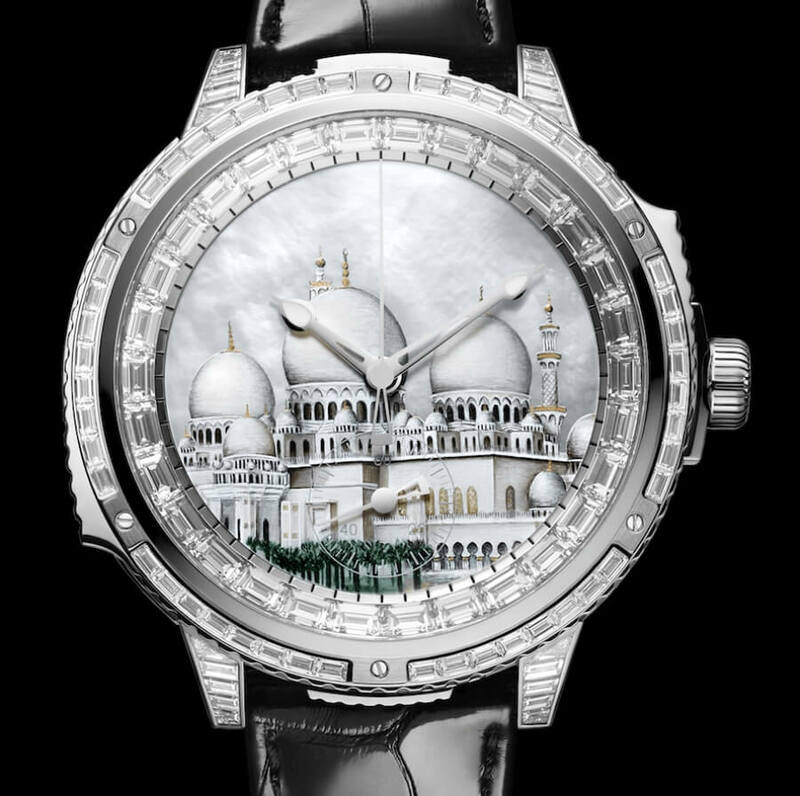 Magnificence surrounds it, too, in the form of thirty baguette-cut diamonds, emphasising the fact that it truly is one of the wonders of the modern Islamic world. The case is also set with 68 baguette-cut Top Wesselton VVS diamonds. This unique timepiece will remain the only one of its kind. It was created by Louis Moinet as a tribute to Sheikh Zayed and the United Arab Emirates, and has already been purchased by a well-known Sheikh from the Sultanate of Oman, at a price of CHF 2 million.